Description: This herbaceous perennial plant is up to 8' tall, branching regularly. The stems are smooth, round, and hairless, varying from light green to brilliant purplish red. The latter color becomes more prominent as the season progresses. The rather large alternate leaves are up to 10" long and 4" across. They are broadly lanceolate or ovate, with smooth margins, and prominent veins. Their color is often light green or yellowish green, particularly in sunny locations, and they have narrow petioles about ½–1" long. Many of the stems terminate in solitary inflorescences that are about 3-6" long, 1" across, cylindrical in shape, and often somewhat curled or drooping. Each inflorescence consists of a narrow raceme of numerous small flowers that are arranged all around the flowering stalk on short pedicels. These pedicels may be green, white, pink, or purplish red, depending on the stage of development for the flowers or fruits. The flowers are about ¼" across, consisting of 5 lobed white or pink sepals that flare outward, no true petals, and several green carpels folded together in the center. The shape of the carpels resembles an inverted bowl that is indented in the middle. After the flowers fade away, these carpels develop into fruits. When mature, they become dark purple and rather shiny on the surface, containing reddish purple juice. They are about ¼" across, and shaped like slightly flattened spheres. Each fruit contains 10 glossy black seeds that are smooth and lens-shaped. The root system consists of large deep taproot. When damaged, this plant exudes a bitter rank odor. Cultivation: The preference is partial sun, moist conditions, and rich loamy soil. However, this plant will grow in full sun, drier conditions, and other kinds of soil, consisting of clay or gravelly material. Under these less than ideal conditions, plants will be substantially smaller in size. When drought occurs, the lower leaves may wilt, turn yellow, and fall off their stems. The foliage appears to be largely impervious to insects and disease. 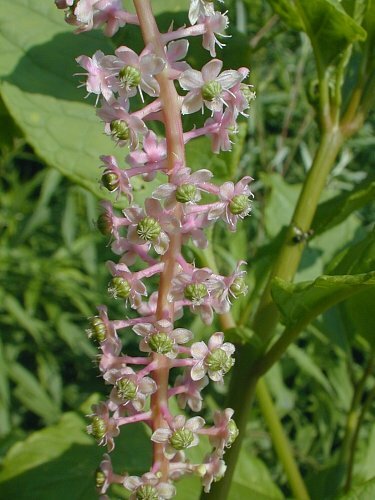 Range & Habitat: The native Pokeweed occurs in most areas of Illinois, except for some counties in the NW section of the state (see Distribution Map). 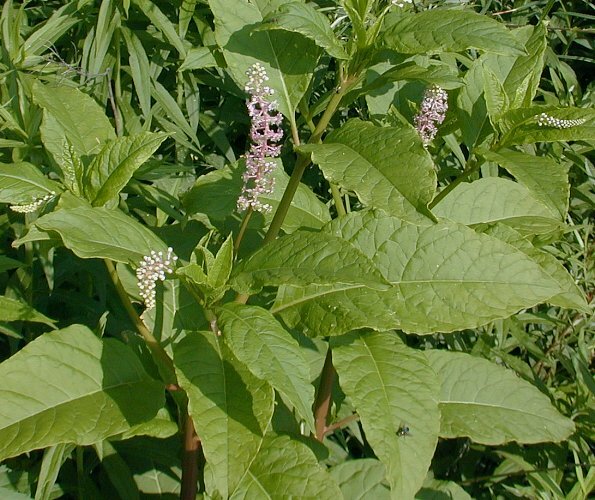 This plant is quite common where it occurs, and widely regarded as a common weed. Habitats include moist meadows in woodland openings, thickets, woodland borders, gravelly seeps, edges of marshes, powerline clearances, fence rows, pastures, abandoned fields, vacant lots, neglected gardens, and areas along drainage ditches, roadsides, and railroads. This plant favors areas with a history of disturbance from mowing, plowing, and other causes. Faunal Associations: The flowers are visited primarily by Syrphid flies and Halictid bees. Wasps and other kinds of flies are less common visitors. These insects usually seek nectar; Halictine bees also collect pollen. The berries are popular with birds, especially songbirds favoring brushy thickets and woodland areas (see Bird Table). The berries are a source of food to some mammals, including the Grey Fox, Raccoon, and Opossum. These animals help to distribute the seeds far and wide. 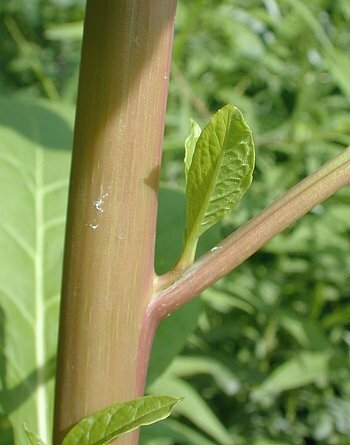 Mammalian herbivores usually won't consume the foliage and stems because they are somewhat toxic and bitter, particularly when this plant is mature. They contain chemicals that can damage red blood cells. The berries are also slightly toxic because of the seeds, although birds (and possibly some mammals) enjoy some immunity from adverse effects. There have been reports of birds becoming intoxicated from eating berries that have fermented; fully ripe berries have a flavor that is bland, mildly sweet, and with a slightly bitter aftertaste. Photographic Location: The photographs were taken at Judge Webber Park in Urbana, Illinois, and a vacant lot near the same city. Comments: This unusual plant has a striking appearance when mature because of the bright reddish purple coloration of the stems. It is probably a signal to migrating birds that the berries are ripe. The individual flowers are also attractive when they are viewed up-close. 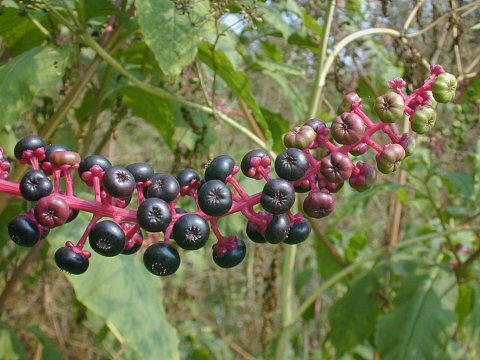 However, Pokeweed is usually dismissed as a mere weed, even though the berries have considerable ecological value to many songbirds. The purple juice of the berries has been used as a food coloring. 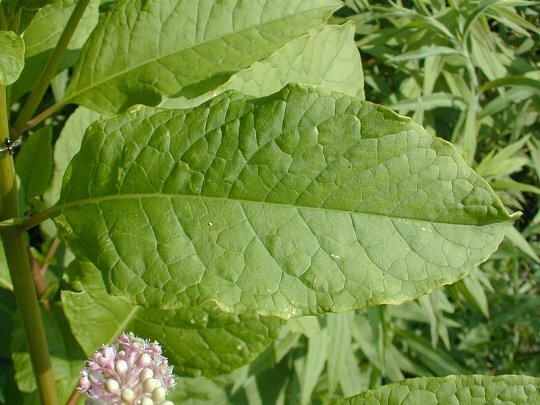 Pioneers used the young leaves as a potherb and the roots for medicinal purposes, but neither of these practices can be recommended.